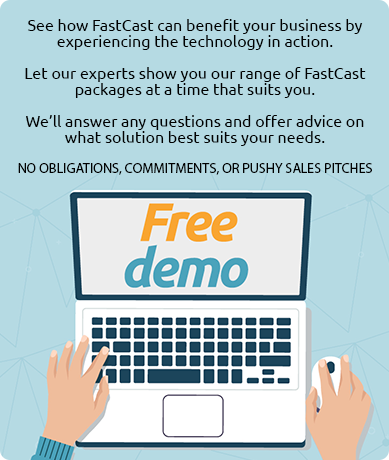 Welcome to FastCast; the brand-new, hassle-free, super-quick approach to webinars, available exclusively from 247 Webcasting. FastCast provides you with the same, unrivaled, market leading*, professional platform technology our subscription clients enjoy, but now we can offer our premium services without the need for a contract or future commitment. What’s more, we can offer this service in as little as 30 minutes from booking to broadcasting. No one else offers you that. We’ve checked. So, whatever your webcasting requirements, specification, or budget, we have a package to perfectly suit you, because at 247 Webcasting, we know that one size does not fit all. We leave that approach to our competitors. * Awarded ‘Best in Market’ by Frost & Sullivan for 3 years in a row.